I’ve said it elsewhere, and I’ll say it here. You know what cracks me up the most about Margaret Rose Realy? She keeps telling people she is not a writer. 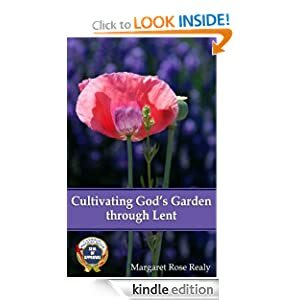 Just in case her beautifully written blog isn’t enough cause for doubt on that, Cultivating God’s Garden Through Lent goes and flat out proves her wrong. If Margaret isn’t a writer, then I’m a toasted cheese sandwich. Cultivating offers daily reflections for each of the days of Lent. These reflections come from the writer’s (see? I’m calling her a WRITER again) experience bringing order to gardens both real and spiritual. At every turn of the trowel, every sprinkle of seed, every tug of a weed, Realy points out to us the rich, loamy meaning that God has for us, just waiting there quietly, if only we will make ourselves still and small enough to see. The WRITER does this, shares the fruits of her contemplation with us, and in doing so, invites us to examine our own gardens, wild and weed-ridden they may be. If we stop and look with her, we will see the kind of quiet, luscious adventure that only a gardener can find. This is the first book to ever make me wish Lent could be longer than it already is. The meditations in Cultivating are just the right length to slow you down without dragging it out, and the messages are presented so clearly as to engage even the reader who is least likely to enjoy her time in an actual garden. I know this because I am that reader least likely to enjoy time in an actual garden. Anyway, I am very much looking forward to re-reading this gem come Lent 2014. I cannot wait to see what sorts of seeds come forth from the re-read during that time of cold, silent, invisible growth.